I’m encouraging a vine to tumble over the railings of our first floor balcony. To my dismay the leading tips were infested with aphids. I could hardly see the delicate green shoots for the fat clusters of writhing black bugs. Along came an army of ants to harvest the honeydew that blackfly excrete from their nether regions. I was up close and personal to watch the toxic bugs raise their backsides to let the ants feed. Yuk! The intimate, symbiotic relationship that exists between these creatures is a wonder of nature. Well I was having none of it. I sprayed them all with copious quantities of soapy water. It was bit like watching a disco full of drugged-up ravers being drowned at a foam party. Murder, he wrote. 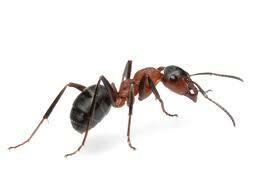 On the whole I rather admire ants and their ability to clean up the litter of dead bugs that regularly fall to earth. As I was sipping my morning cuppa I observed a platoon of tiny ants (a different breed from the aphid arse-lickers) slowly tug a dead fly the comparative size of a jumbo jet across the patio. Their collective iron grip was momentarily loosened and their prey tumbled into the gap between the floor tiles. It must have seemed like lunch had fallen into a monsoon drain. Unperturbed, the industrious insects hauled the fly carcass from the depths and continued their mammoth trek back to the nest. Marvellous. Ladybirds or lacewings for aphids. They take no prisoners. Know exactly what you mean about ants. They meticulously drag all of the widely-flung parrot food from the floors of the parrot house – platoons of ’em all working together to feed the unit, and I can’t help but feel we should watch and learn. Then I find columns of them marching up the mesh and into the food bowls and I feel, being a mere flawed human, the urgent need to wage war. Insect rave party! Get the mini-sized glowstix out!